The Pizza Bible - Detroit Pan Ruined? I have a small Detroit Style pan and I’m afraid it’s ruined. Will someone please view the attached image and let me know? That's definitely not ruined. 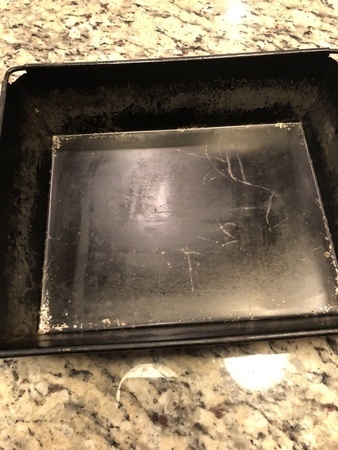 I've got the same pan and the seasoning comes off over time. You can definitely re-season the pan. Thanks!!! How does one reseason? Cover the entire pan in a thin layer of vegetable oil (thin!!!). Then put it into the oven at 500°F for one hour. Repeat process 2 - 3 times. Sounds good!!! I'll do it tonight... and I'll post pictures! You may want to consider an oil with a higher smoking point.